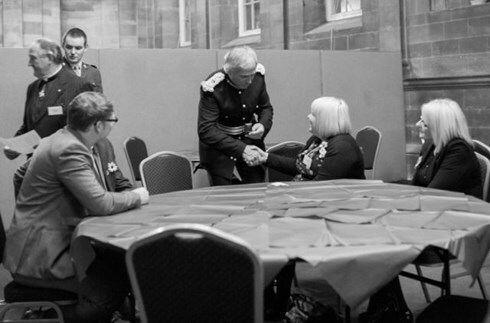 We are so proud to share with you some pictures from the award ceremony in honour of Beth. Although she is missed every hour of every day we as a family do find great comfort in knowing that other peoples lives have been changed and that her memory has not been forgotten. We hope that everyone will discuss the concept of organ donation with friends and family and ultimately sign up on the register. The UK Award for Organ Donation honours the incredible gift that donors and their families make by donating their organs to save and improve the lives of others. This special recognition pays tribute to the quiet heroism of organ donation - an act never forgotten by those whose lives have been transformed. 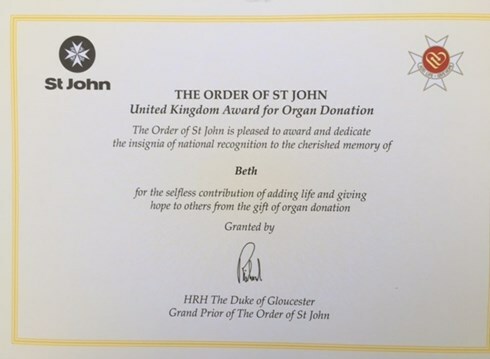 The Order of St John are an international humanitarian charity and created the award which represents a shared belief in the role of organ donation across all faiths and backgrounds. “Together we aim to achieve recognition for the act of donation whilst also encouraging conversations about organ donation to start amongst communities across the UK”. The award which was launched in 2013, is offered by invitation to all families whose loved one donates in the UK and is given posthumously to the donor, accepted on their behalf by a relative at a regional ceremony. The Order of St John award for Organ Donation, run in conjunction with NHS Blood and Transplant, has been presented to the families and loved ones of those who saved and improved people’s lives through organ donation. 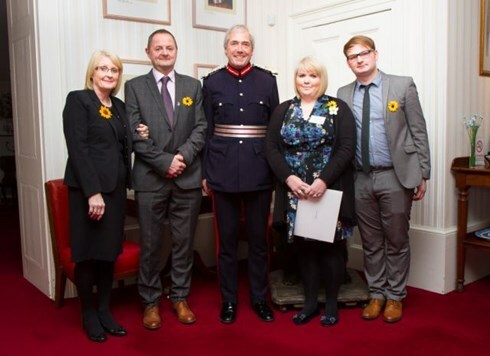 Hundreds of families attended regional ceremonies across the UK between September and December to receive the award in memory of their loved ones whose deaths saved lives and gave hope. NHS Blood and Transplant and the Order of St John are both keen to recognise the incredible gift that donors and their families have made by donating their organs to save and improve the lives of others. Last year, between April 2013 and March 2014, saw the largest ever number of deceased organ donors as the families of 1,320 people in the UK agreed to donate their loved ones’ organs, leading to thousands of patients' lives being saved or transformed. Sally Johnson, Director of Organ Donation and Transplantation at NHS Blood and Transplant, said: "We launched this award scheme last year and were overwhelmed by the pride and experiences shared by the hundreds of families who accepted the award on their loved one’s behalf. It never ceases to amaze me just how humble people are when you speak to them about having helped to save the lives of patients who were desperately ill. I have never spoken to a single person who has ever regretted their decision to donate. “These families deserve this honour and recognition of their life-saving gifts. We hope their bravery will inspire others to talk about their own wishes with people close to them and record their intention to donate on the NHS Organ Donor Register." Families of last year’s 1,320 organ donors have all been invited to receive the award, displaying the words ‘add life, give hope’. 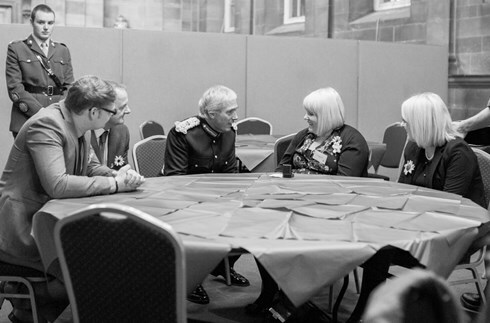 The Order of St John, which has is roots in the 11th century, is a major international charity with a worldwide footprint of over 400,000 volunteers and staff, delivering 16 million hours of volunteering each year to help people in the community. Its work is centred on delivering first aid and care, along with education and training to improve community health. The Order is the parent charity of St John Ambulance, the nation's leading first aid charity.